In one week I will be 37. Being single at this age is a lot different than being single at 17 or 27. I’m comfortable with myself in ways I wasn’t at those ages. Growing up I was forever being told, “You’ll make a great wife one day.” Maybe I still will. It’s never been a passionate pursuit. Perhaps naively, I expect the Lord to open the door for marriage if that’s what He has for me. Since it’s not yet opened, I’ve created a life for myself – walking through the doors the Lord has opened. Being alone is hard sometimes. Being an introvert and wildly independent, I’ve had to intentionally create community. Nearly 6 years ago I moved from the city I grew up in to a small town. I knew a few people since the church I attend and worked at was located in the same town. Some of those friends have since moved away. Others have entered my life but it’s taken intentionality to build those relationships. Making friends when you’re older is harder – there are kids and schedules and unshared histories. But, as a fulltime homeschooling single mom, I need community to keep my sanity. That’s the most important thing I’ve discovered at this point. My kids are wonderful yet limited. Recently in applying for a job (part-time working from home), I was asked to provide two references. Who to choose? I messaged a friend for advice. She was slow in responding. So I talked through the dilemma aloud while eating dinner with my girls. 4yr old Athena insisted I include our friend’s dog. I’m not sure he’d be the best choice. When a puppy, I cared for him daily. Now that he’s older our arrangement is: I can stop by to walk him whenever I want while my friend’s at work. I must admit that hasn’t happened in ages because it’s been so cold and I’ve been so busy. I doubt he’d have anything positive to say at this point. I look forward to the time when my girls are older and friendship blossoms between us. For now, I am responsible for their daily care and instruction. It’s a beautiful relationship, but more demanding than I ever imagined. Having a partner might lighten the load, but I won’t waste time lamenting. The Lord has enabled me to adopt as a single woman. I am fully capable on my own. I am whole and content. There’s room in my heart and life should that door open, but I won’t devote myself to a possibility. My kids need me to be fully present for them. I need to fully engage with them not allowing imagination and longing to sap my strength. It’s taken a long time for me to get to this point. Growing up, I often imagined the glory of marriage. In my mid-20’s I was heartbroken by the end of a romance. I spent a great deal of time longing for that man. There are fleeting moments when I still miss him. There are times when I think, “if only I had….”. Everything could have been different. Maybe it should have been. But it isn’t. This is my lot. I have two beautiful daughters, a lovely home, the opportunity to be a full-time mom, friends who care for me, a family who are excited about the wonderfully unusual life I have created. 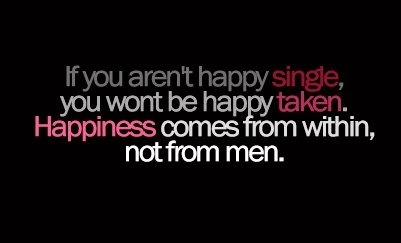 Being single isn’t a problem I need to fix. It’s an opportunity I’m striving to make the most of.